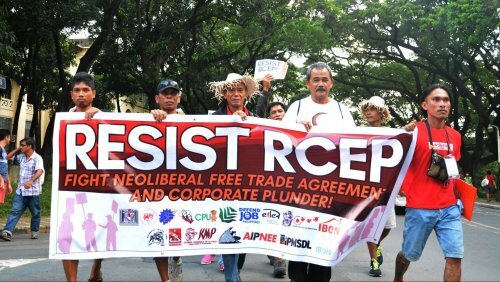 Can Labour bring labour rights to RCEP ? Today, Parker’s associate Damien O’Connor is in Singapore for a ministerial meeting on the Regional Comprehensive Economic Partnership (RCEP), which would make up the largest trading bloc in the world. Will he push to make the RCEP a gold standard agreement as well ? Will Labour push for the hasty conclusion of RCEP without ensuring fundamental labour rights are part of the deal ? Would it be right for New Zealanders to accept the trade benefits from liberalised supply chains that pass through countries like Cambodia, Myanmar, Vietnam, Laos or South Korea, where workers’ rights cannot be guaranteed ? When first becoming Trade Minister, Parker said that his priority was to conclude a FTA with the European Union, with one of the motivating factors being their similar views on labour and environmental standards. Will we have to wait until that negotiation before Labour pursues a gold standard agreement ?